The Head Halter- Torture & Pain and This Nonsense explained. I can’t even begin to tell you how much I hate head halters. It boggles my mind that so many trainers call prong collars cruel, and have clients strap these devices on their dogs—and then call it positive training. I’m talking, of course about Gentle Leaders and Haltis. There are a couple of design differences between the two, but they’re essentially the same thing. In this article, I am going to focus on Gentle Leaders for one highly personal reason: their advertising is so misleading and deceptive that they’ve suckered people into thinking they’re “humane.” It bugs me. A digression into the subject of pulling. The head harness manufacturers will tell you that head halters are a good training tool, but the fact is that the vast majority of people use them to manage their dogs’ pulling. The thing you need to understand is that dogs like to pull. It is a very rewarding activity. There seems to be a trajectory when it comes to managing pulling. People worry that the dog will damage its neck when pulling on a flat collar. They’ve been told prong collars are cruel, so they stick the dog in a harness. And when harnesses don’t work, people are assured by Gentle Leader advertising that this product is a humane, positive method of training your dog not to pull. The only thing “positive” about a Gentle Leader is that you use clickers and food to bribe the dog to let you put it on. They hate it. Gentle Leader or medieval torture device? What is more cruel–a prong collar or a Gentle Leader? A lot of people will point to the prong collar, mainly because they aren’t educated in how they work. And after all, a Gentle Leader is …. gentle. But don’t let the soft straps and cheerful colors fool you. Head halters are far more aversive than a prong collar. I’ve heard people say, “But it works!” My response is yes, it works. But you have to ask yourself WHY it works. The Gentle Leader® does not choke your dog. It is scientifically designed to direct your dog’s entire body by controlling his head and nose. And wherever his nose goes, his body must surely follow! The Gentle Leader® dissuades your dog from pulling on the lead by transferring the pressure of his efforts to the back of his neck via the neckstrap, while the pressure of the noseloop communicates your reassuring control. Your dog’s instinctive resistance to these redirected pressures causes him to stop pulling to relieve the pressure at the back of the head and to relax and walk easily by your side. The Gentle Leader pivots the entire weight of a pulling dog on its nose. The pressure of that weight forces the dog’s head to turn. It’s called torque and it hurts. Also, the company says that there’s pressure transferred to the back of the neck, but a simple look at where the lead attaches demonstrates this isn’t true. It’s all on the nose. Imagine a 50-pound dog running forward, hitting the end of a leash and having its neck snapped around. We’re talking serious damage. Even on a slower walk, hitting the end of the leash is painful. So yes, it works. Dogs don’t pull because they know that it will hurt like the dickens if they do. Gentle Leader calls it “power steering.” The handler doesn’t have to do anything because the halter does it for them. Not convinced? Consider this: Dogs hate Gentle Leaders so much that you have to condition them to accept just putting one on. And then there’s the following gem, excerpted from a guide written by a positive training company. This sums up just how aversive Gentle Leaders are to dogs. The bolding is mine. It’s very important that you acclimate your dog slowly to the Gentle Leader. The neck strap is a pressure point that reminds your dog of the pressure the mother dog puts on the back of the neck when she picks up the puppies in the litter. The nose strap reminds your dog of the Alpha dog as it’s similar to the pressure a higher ranking dog may use as a correction. Therefore, when your dog first experiences the Gentle Leader, he may think the mother dog and Alpha dog are sitting on his head! As long as you associate really positive things with the Gentle Leader, and never take it off when you’re dog is struggling, he or she will begin to enjoy having it on as it means walks and treats. 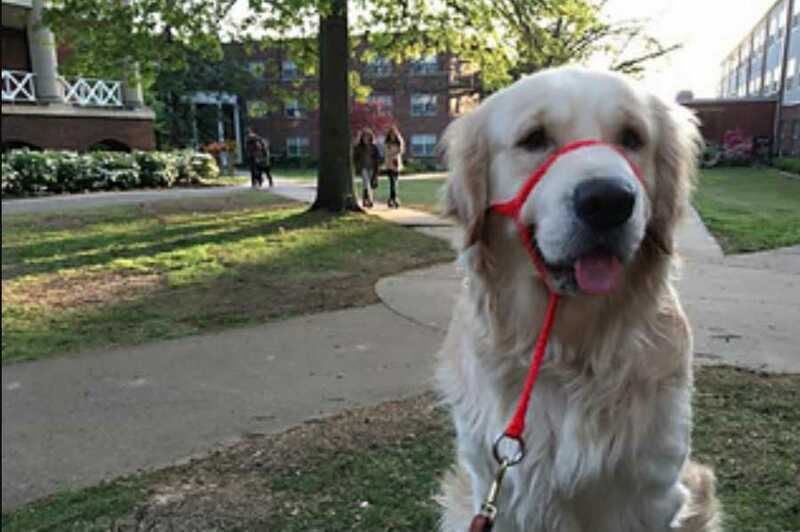 Always put the Gentle Leader on with a leash attached. If your dog fights it immediately when you put it on, GENTLY lift up on the leash at a constant rate towards the sky until your dog settles down and stops struggling. As soon as your dog relaxes, immediately loosen the gentle pressure on the leash so there is a ‘J’ in the leash, and praise and treat. Please DO NOT tug, jerk, or pull on the leash like you would with a choke chain correction. When lifting up on the leash, you only want to apply gentle pressure to the head collar so your dog will ‘give in’. In the beginning, put the collar on your dog several times a day for 2-3 minutes, give him treats, throw a toy, feed him, etc while he has it on. At the end of the 3 minutes, if he is not struggling, take the Gentle Leader off. Never take it off if your dog is struggling, because that is a reward for struggling. Gradually increase the amount of time he wears it in the house, and then begin putting it on at the end of your walks when he is tired. Increase the amount of time he wears it towards the end of the walk until you are actually putting it on in the beginning. If your dog tries to rub his nose on your leg, or sweep his head through the grass, don’t let him. Lift up on the leash as stated above, and then loosen the leash and praise when he stops. Above all, make the time he has the Gentle Leader on FUN! Your dog will resist when you put on the Gentle Leader because he will think he is being chastised and dominated. Do it anyway. Use food as a bribe. Ignore signs of distress. Eventually, your dog will give in. Whether they give in is also debatable. A huge percentage of dogs will always fight them. A proper fit is uncomfortable. I have a lot of people show up with Gentle Leaders and Haltis on their dogs. I will never forget one particular dog. The bone underneath the head halter was shot. I mean, literally shot; his muzzle was almost concave because of the sheer pressure on his nose over an extended period of time. This was an extreme case, but I also see many other dogs with no fur on their faces because they try to rub them off. Some of these dogs have been wearing these for years, and they’re still trying to get them off. I tell you all this because there are a lot of Gentle Leader and Halti fails out there. When you bring them up, the inevitable response is that it wasn’t fitted correctly. Even though the Gentle Leader® fits much more snugly than other collars you will notice that your dog is still comfortable, able to pant easily & shows no signs of distress or discomfort. And yet this is a demonstration of what the proper fit looks like. Enough said. Call me crazy, but I don’t understand how it is humane to use a tool that yanks a dog’s head around with more force than anyone could ever do with a prong collar. And I fail to see how it is positive to force a dog to wear something that it finds painfully repugnant. This, my friends, is where the cognitive dissonance begins. The people pushing head halters are the so-called positive people. Please someone, explain to me the level of denial that exists here. How do they reconcile this? Do they stick their fingers in their ears singing LA LA LA while frolicking among positive rainbows and unicorns? And someone please tell me—how on earth do these people justify demonizing prong collars and then sticking these head cages on dogs? It’s absurd. It’s so absurd that it’s laughable. Or at least, it would be laughable if we weren’t so busy fixing the damage caused by these people. Train or manage—it’s a choice. Remember when I said that that pulling is a rewarding activity for a dog? Here’s the thing: there are two ways to deal with pulling (and pretty much everything else too). You can either train the behavior you want, or you can manage the behavior you don’t want. I prefer to train the behavior that I want. Head halters aren’t the way to do that. They just manage the behavior. And they do it through pain.